Tall perennial growing to a height of 1.5m. This plant is also classed as a biennial, plant growth in the first year and flowers in the second year. Mostly reddish-purple colour but white variety can also be seen. 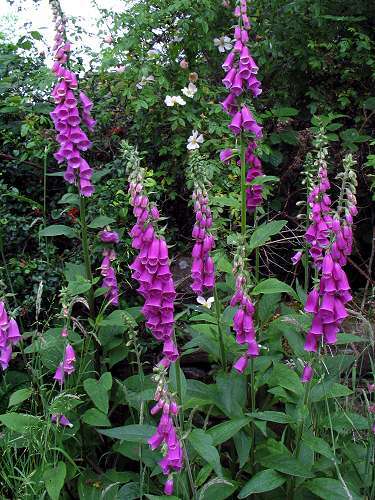 The name Foxglove seems to have originated as 'Folks-glove' the flower shape similar to finger gloves. Its latin name 'digitalis' also suggests a connection. Parts of the plant are poisonous to humans and livestock.